Greater Georgetown, Guyana – Work has advanced toward the full operationalisation of the Caribbean Centre for Renewable Energy and Energy Efficiency by the middle of this year. 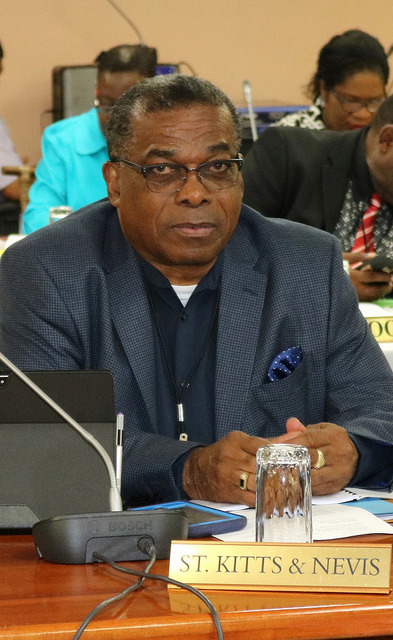 This was one of the key outcomes of the special meeting of the Council for Trade and Economic Development (COTED) on Energy held April 19 at the CARICOM Secretariat in Georgetown, Guyana. Chairman of the meeting, the Hon. Sen. Darcy Boyce, minister of state in the Office of the Prime Minister of Barbados made the announcement at the end of the meeting Thursday. His announcement came on the heels of Montserrat depositing its instruments of ratification of the agreement establishing the centre during the preparatory meeting of the COTED Tuesday. Montserrat became the fifth country depositing its instruments with the CARICOM Secretariat, thus paving the way for the Centre to have a legal identity. The Hon. Paul Lewis, Montserrat minister of communication, works and labour, handed over the document to Joseph Cox, CARICOM assistant secretary-general, trade and economic integration. Barbados, Dominica, Jamaica and Belize were the other member states that have deposited their instruments of ratification. “We can then move forward with appointment of the executive board and staffing of the Centre”, Boyce said Thursday evening after the one-day meeting. The centre is intended to function as the implementation hub for the CARICOM Energy Policy, as well as the Caribbean Sustainable Roadmap and Strategy (C-SERMS). In 2015, CARICOM heads of government approved the establishment of the CCREEE and identified Barbados as the host country for its secretariat. The COTED agreed to interim operations of the centre in January 2016. The ministers on Thursday made decisions related to the transition from that interim stage to the first operational phase. When fully operational, the centre is expected to improve the quantity and quality of programmes and projects in sustainable energy within the region. The action-oriented institution will lead to improvements in sustainable energy production, delivery and use, through increased renewable energy applications and energy efficiency measures. “We had a very useful meeting, and I expect that we would have put ourselves in a position to achieve a lot more in the energy sector, in renewable energy and energy efficiency over the next few years”, the COTED chair said. Boyce added that the ministers made “good progress” on the matter of labelling of energy efficient equipment within the region. This step, he said, would ensure that people knew “exactly what they were getting” when they bought equipment and sought to encourage them to acquire more efficient equipment and appliances for their properties. The ministers approved a pilot programme that will get underway shortly to promote energy efficiency in commercial and residential buildings. Substantial discussions were held on integrating climate resilience into the C-CERMS against the background of the region’s vulnerability to intense climate-related events. Matters of insurance, and electricity disruption were discussed. “We felt that we needed to discuss ways in which we could get the work done to guide us… to become more resistant to those situations, and to help us to recover faster” when there are natural disasters, he said. Ministers also took stock of the availability of technical assistance under the CARIFORUM Regional Programme for Energy under the 11th European Development Fund to get the resources that were necessary for studies and to implement projects to grow the energy sector, Minister Boyce said. The ministers also had robust discussions on oil and gas in the region. A working group is to be established to consider how there could be deeper cooperation and more advice available on the technical matters on that sector. At the opening of the meeting on Thursday morning, Boyce made reference to the region’s oil and gas sector, and its potential to benefit the populace.